Work with bi-metal materials started with my father’s family business (Otter Controls). Eric Taylor invented his bi-metal blade and I decided that I wanted to make it smaller. I made it about the size of a 50 pence piece. I remember showing it to people, who would always say, “Gee, that’s small” so I decided to call it the Otter G.
In the 1960s Jaguar, the car manufacturers, were looking at new ways to place the radiators in their cars. They were having terrible trouble sorting out the cooling fan system, so they used my patented invention in the engine cooling systems in the cars. I used to have the job of testing the cars on the race tracks. You can only imagine what fun that was! We started to export controls to Germany to use in all sorts of electrical items, and they took off in a big way. A few years ago, after I retired, I was speaking to the current Chairman of the company. I’d noticed that the Otter G was still being made, so I asked him how many had been made in total. Since I left the company in the seventies they’ve made, and this is only an estimate, almost one billion of these little bi-metal blades. I’m very proud of that, as I am for the Queen’s Awards, three for Export and one for Innovation, granted for my 360-degrees cordless kettle connector. I can go to any high street in the Western world, look in the window of any shop selling kettles, and say “I designed that one, designed that one, designed the controls on that one”, and it’s a very satisfying feeling to be able to say that. 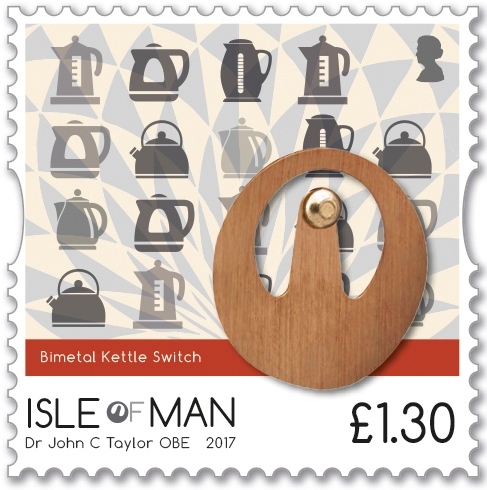 The Isle of Man Post Office have featured two of my best known inventions in the following two postage stamps. 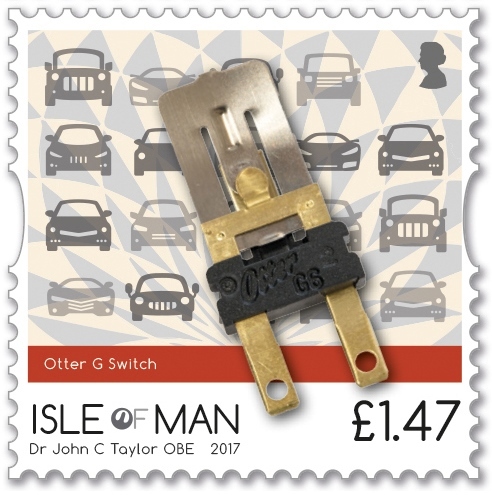 The Isle of Man Post Office has featured two of my best known inventions in the following two postage stamps.